Between the four of us, we have been to 56 North a very large handful of times. It is for this reason that I have decided to talk about what a wonderful place it is. 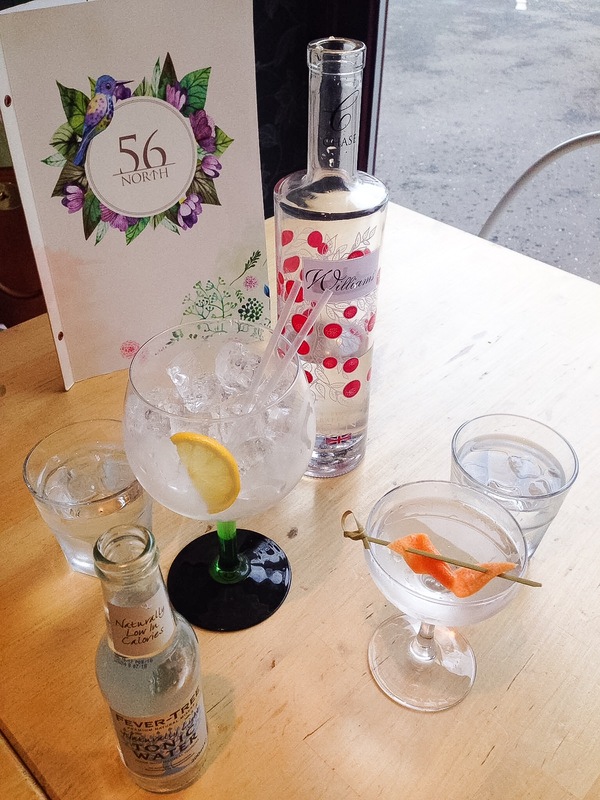 For those of you who don't know, 56 North is Gin heaven. Their gin menu is literally like a Bible and it's one of my favourite books. They source their gin from all over Scotland, and its such a treat to have so much variety knowing thats it's local (although if you are as indecisive as myself then it can be a bit of a nightmare). Not to mention, they also have plenty of delicious cocktails for non-gin lovers... if they even exist. Other than the amazing array of gin/cocktails, the food at 56 North is also wonderful. Throughout my many times there I have tried the burgers the steak the Hendricks sorbet with smoked salmon (absolute must try) and pretty much all of the sides including my faves; asparagus spheres with parmesan, whole roasted avocado and sweet potato fries. Everything I have had so far has been amazing. During my most recent visit I decided to try the 'Mezze Board' which included Mediterranean veg, olives, smoked paprika chicken breast, the roasted avocado, soft goats cheese, a yoghurt/coriander dip and some ciabatta bread. Due to my indecisiveness, this was the perfect choice for me and every element of the dish was so tasty. I will definitely be having that again. Even better, the 'Secret Gin Garden' which I was lucky enough to have time to visit during the festival as it is closed for the rest of the year, was such a nice place to relax and enjoy a gin for that one day it was sunny in August. It is the perfect location to get away from the craziness of the festival but just a quick walk away from it all. They also serve brunch from 11-2pm everyday which sadly I have not yet had the chance to try but I will definitely keep in mind for future brunch dates. Some advice for anyone who is looking to visit, don't be intimidated by the 9541487 gin's on offer, the staff are so helpful and knowledgeable they won't let you go wrong. And if you really want to learn more then you can book yourself a Gin Masterclass! Wow! The food looks incredible. I haven't visited Edinburgh in ages but will definitely put 56 North on my list when I do. Wow this looks amazing! I love edinburgh but haven't been for a while so will definitely add this to my list! This looks like a really lovely bar and the food looks pretty good too! Your welcome! It's a great place, i'm sure you will love it! 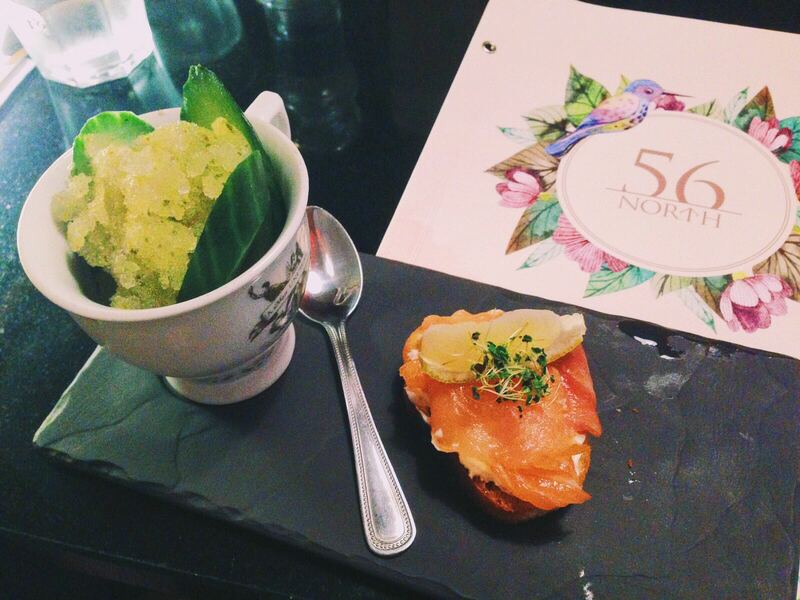 this food looks really tasty and I think I'd enjoy visiting 56 North. I do like reading your food reviews. Thank you so much, I am sure there will be plenty more to come! I wish there was a place like this in London - definitely will bookmark this for when we come to Edinburgh. I've read about Edinburgh before in this book called "Vince and Joy" to actually have someone share their real life experience about it is pretty surreal to me :) Thanks for sharing. Love the ambiance and the food looks great! Thank you! It's a beautiful city, I am so lucky to have the experience of living here. A gin masterclass sounds like a lot of fun. I have never done this. The food is looking amazing too! Sounds like the perfect event to go to. I've not been to Edinburgh yet but really want to! this place looks fab!! Oh wow, that burger looks epic. I love it when burgers are served with a HUGE onion ring. Wow! Sounds awesome and looks delicious! And a gin masterclass?! Sounds fun! This looks lovely, love how the food is presented! That food is so instagramworthy lol! :-) Loving it! This looks like such a lovely place - LOVE the flying saucers in that cocktail! Gin is my fave, will totally look this place up if I'm in Edinburgh. The food looks yummi as well as the drinks looks great! Yes, it's definitely worth visiting! Check out our Instagram to see more of our favourite places to eat. What a lovely place to meet and mingle. Lovely drinks . The food looks incredible, I could actually eat that burger right now! Wow what an amazing sounding place to visit - I have to admit I've never heard of it before, but I would love to visit one day for myself. Oh my goodness, that looks epic! I haven't been before but I would totally go now! Gin and cocktails - sounds like my perfect place! Shame it is so far away from me! Been to this area only once before but never here. That food looks very tasty... not to mention the cocktails!